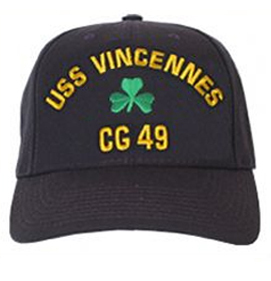 Now you can have your own, original USS Vincennes CG-49 ball cap just like the originals. This newly manufactured cap is constructed of a wool/poly-blend and is the exact construction of the current U.S. Navy ball caps. In keeping with the current caps, all of the lettering and emblems are directly embroidered onto the hat shell (rather than the archaic embroidered patch that was sewn to the front of the hat). This USS Vincennes cap features the ship's name embroidered across the top of the front panel as well as the hull number ("CG-49") on the bottom. In the center is the original 3-leaf clover. Just like the original, this cap will have emblazoned across the back, "Team 49." Members of the commissioning crew can add on "Plankowner" script at no additional charge. There are limited quantities available for these caps. We have sold over 200 caps with previous pre-orders and we do not have any pre-orders for the forseable future. Be sure to order yours before they are gone! 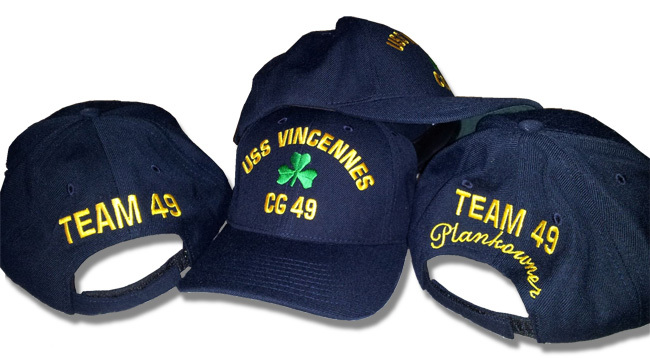 USS Vincennes Enlisted Ball Cap | back panel w/"Team 49 + Plankowner"
Quantities of 1-2 will pay the same (estimated) shipping cost: $8.35. Shipping is calculated based upon packaging and weight.